Remember those days when you took photos with disposable cameras? Fondly referred to as “disposies,” there was something so satisfying about spinning the dial and feeling the click beneath my fingers. Even when the pictures turned out lousy, the process was still good fun. I like to think of disposable vapes this way too. My experience with disposable vape pens depends on two major factors: the oil’s quality and the packaging. Knowing Pure Vape has solvent-free, triple-distilled cannabis oil in all their products, which I’ve seen in several SoCal dispensaries, I’m optimistic. But I’ve never heard of an apple cinnamon fizz strain. Is there a trade-off like so many disposables, or does this Pure Vape Apple Cinnamon Fizz 300mg disposable vape pen provide an equally impressive balance of both? Let’s start puffing and dig into the specifics. I first noticed the minimal packaging, brief labeling, and green apple/neon green color. The disposable vape comes in a generic, thin plastic tube with a rubber stopper at the top–which it fell off and didn’t offer great protection, making me feel uneasy. “Pure” is labeled in white on the pen along with graphic of a drop of cannabis oil at the bottom. The lack of detailed information doesn’t help. There’s more space for a picture of an apple with a cinnamon stick than the key info like cannabinoid percentages, derived hybrid strain(s) and verifiable testing results, leaving me to question this product’s quality and safety. 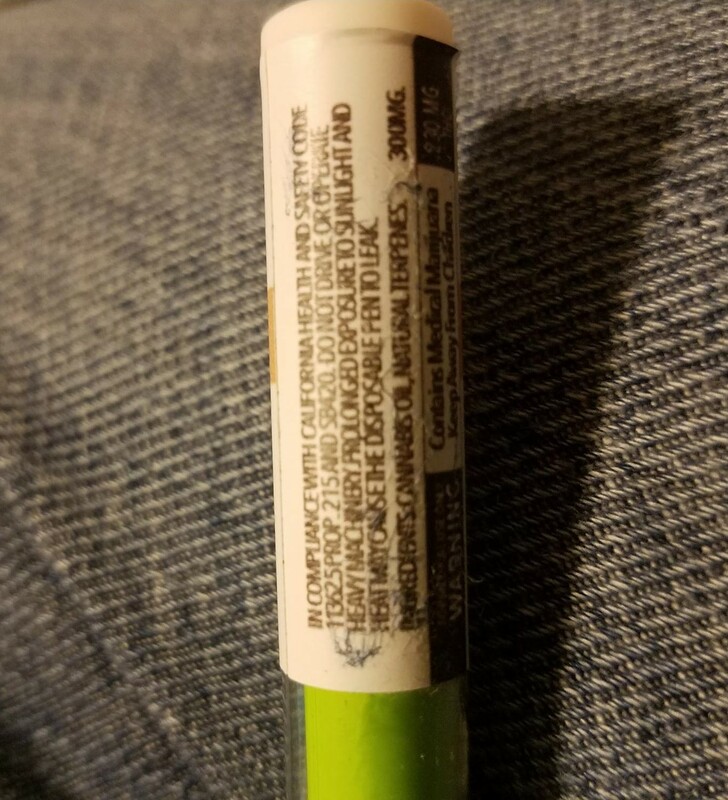 While the back of the sticker provides some info like THC content in milligrams, warnings, compliance and ingredients, its small print and cramped space make it a bit difficult to read. The brand could’ve been more creative and added more, or at least placed a link to confirm these details. This is no time for secrecy and doubt, Pure Vape! Like some disposables, you can’t see the oil within so I don’t know what I’m about to consume. This isn’t uncommon, but I’d like more transparency. This apple cinnamon fizz vape does have a big benefit: it’s incredibly easy to use. No button, no hassle; just whip it out (get your head out of the gutter) and inhale. The bottom light at the bottom lets you know it’s working. The top and bottom have the same round shape that initially made them hard to distinguish, even with the bottom’s Pure Vape drop symbol (I thought maybe of unscrewing it). When I inhaled, the wider mouth felt bulky and uncomfortable compared to a thin, flat mouth like L.A. Kush’s Bertberry Cheesecake disposable. After three solid puffs I noticed the flavor was obviously not cannabis-derived; it tasted like a tobacco vape because of the added flavoring. Disappointing, since I was expecting more of a sweet apple pie taste. The non-cannabis flavors made me a little queasy so I couldn’t use it for long. Even though the brand makes eleven other disposable flavors, I don’t feel compelled to try them. In spite of Pure Vape’s claim, it’s impossible to gauge the quality of their “triple-distilled, solvent-free cannabis oil.” As mentioned, there’s no window to see the oil’s color and viscosity. There are also no lab test results included, leaving me to question this product from the start. This disposable vape pen is definitely an effective hybrid high; more head than body. Based on my gentle giggly feelings, it seems to lean on the sativa side. 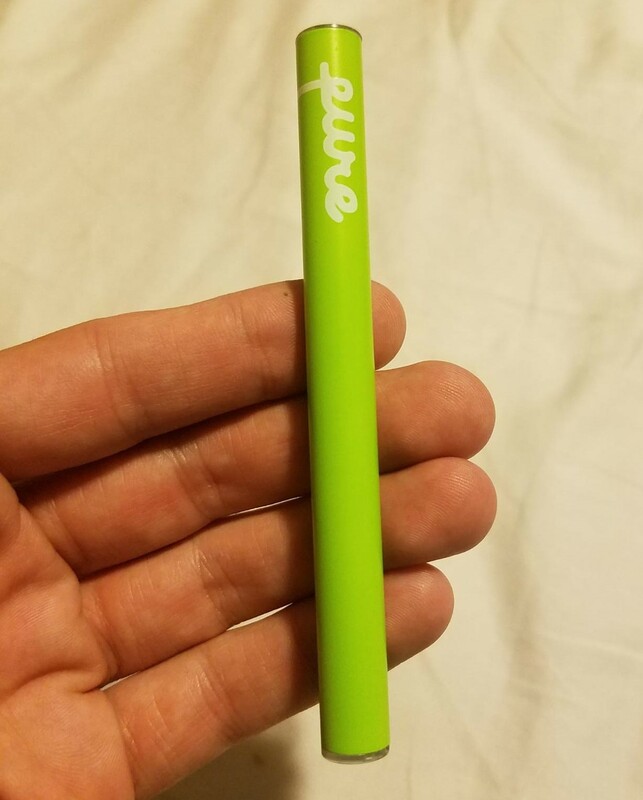 Pure Vape says this pen is good for about 120 uses at 300mg of cannabis oil, which is slightly less than most disposables. Given that three pulls had me “feeling it,” I’d say this sounds about right. For about $25, you do get a certain “bang for your buck.” I personally wouldn’t buy it again as neither the packaging nor the oil met my expectations. Nonetheless, this price it’s worth trying if you like easily and quickly vaping non-cannabis flavors. At that price it could be sweet to offer as an adult “party favor” for your cannabis curious friends. 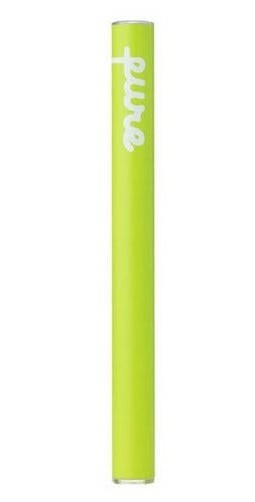 Simply a generic, thin plastic tube with a rubber stopper in the top. The stopper fell off in the bag from the dispensary, so it doesn’t provide the best protection. Product name, health and government warnings, brief ingredients, THC content in milligrams; hardly any information. Small print and limited space made info tough to read. More space given to a picture of an apple with a cinnamon stick than pertinent info. Left me with more questions than answers. An all-in-one, oil-filled, disposable vape pen that seems to be made from plastic and metal. Has a light on the bottom to let you know it’s working. The mouthpiece’s round shape isn’t very comfortable in your mouth and can be hard to distinguish from the bottom of the vape. Tastes as advertised without being super sweet. Cannabis is completely masked by added flavors. Tastes like a tobacco vape instead. Some coughing and throat irritation after three pulls. Absence of a window prevents seeing the oil. Lab testing info is not available. I can only assume the worst. Definitely an effective hybrid head-high that seems to be sativa-dominant. After a few hits, I felt a little nauseous from the “flavors” that definitely were not cannabis-derived. Incredibly easy to use; no button. Just inhale and watch the light activate. Little light shines to tell you that you’re doing it right. The flashy neon/apple green color makes it noticeable, which can make vaping difficult. There’s no hiding it! Personally, these are consistently not pleasurable to vape; but if you like “flavored” vapes, you might consistently like this. I wouldn’t jump at the chance to buy this again. However, the $25 price makes it worth a try if you like vaping non-cannabis flavors. When it comes to my two key factors, Pure Vape’s 300mg Apple Cinnamon Fizz disposable disappointed. The downsides outweighed its positives, which are ease-of-use, convenience and effectiveness (I felt elevated after three hits). While I found this consistently displeasing, if you’re a fan of “flavored” vapes and don’t care much about what’s in yours, you might enjoy Pure Vape’s line of disposable vape pens. Maybe their more traditional vape cartridges rank higher in both my categories and beyond.